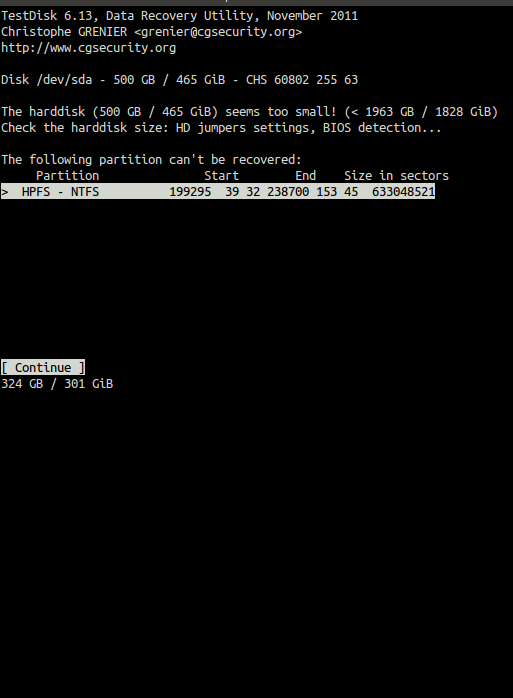 I have tried to recover some partitions using testdisk with deeper search. 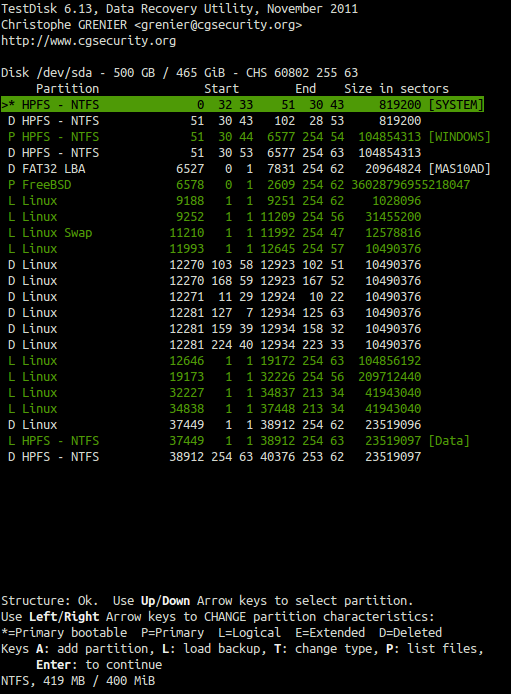 It shows up all my partitions (including the extended ones which were lost with exact sizes in GBs). UPDATE: I tried with 'sudo' as well as 'root' and still the same results. But the problem there is no change after testdisk "wrote" partititon table because, after reboot, testdisk reports back to the same four partitions it sees before running testdisk. Same in the case of quick search. It is back to square one every time with testdisk! How can I write those partitions which testdisk discovers? Or where did I go wrong? Thanks! *PS: I used 'ddrescue' to clone the entire 320GB HDD to 500GB HDD and 'gsmartcontrol' reports the healthy. Last edited by gtree on 13 Jan 2013, 19:36, edited 1 time in total. One point to check is whether you are running testdisk in administrator mode since other modes might not allow write permissions. dragonfly41 wrote: One point to check is whether you are running testdisk in administrator mode since other modes might not allow write permissions. Thanks for prompt reply. But I am running sudo to run testdisk from a liveDVD after checking whether any portion of the HDD is mounted and none of them mounted. So the permission problem does not apply to my case. Do I have to execute them manually? And whether 'device' in above output means partition or HDD? 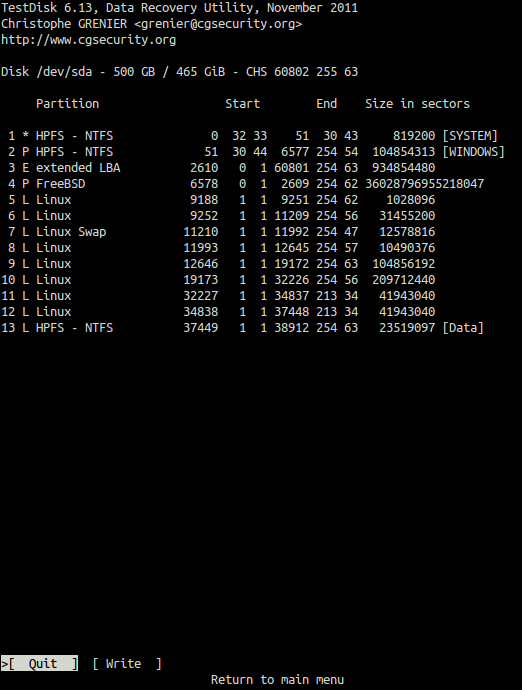 Update: e2fsck man pages states that it is a partition. If it is a partition it won't be possible because fdisk or sfdisk does not see the partion before it writes the modified partition table. So it is like a catch 22 situation. Any inputs from the testdisk developers? I am indeed whining for days to figure out exactly how to overcome this situation. Thanks in advance! I can't speak for the developers .. or offer advice ..
however if you have a Live Linux CD you should have e2fsck available (I have in Ubuntu 12.04) .. I ran command $ man e2fsck to see this usage instruction ..